I played a little sports in Nobeoka. 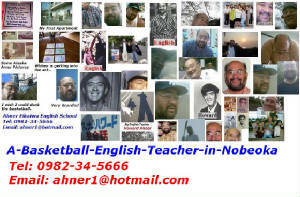 I was a member of a basketball club for about five years. Also, a tennis club for about two years. But, I mostly shot some baskets in our yard. There is also a half-court in Urashiro Cho, Nobeoka that is available. I went there to shoot a half-dozen times. Now, I just walk around town, mostly at night. I call myself, The Night Walker of Nobeoka. See you around sometime. The Corner of the Nobeoka Universe!